The girls look forward to St. Patrick’s Day each year. This year I had them try something new. I gave each one a heart stamp carved from a half a potato. Told them to stamp the hearts next to one another to create a shamrock. They were so excited to see how simple it was to create a printed image of a shamrock. Once they printed a couple of shamrocks, then they took their paintbrushes and added some other elements to their paintings. 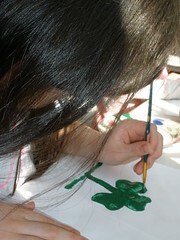 Sophia is painting her St. Patrick’s Day picture of the shamrock, with flowers, sun, and blue sky. This is part of homeschooling art time which she and her sister (Olivia) enjoyed.